Constructed of premium full grain cowhide leather with high tear strength and abrasion resistance. An extra layer of leather is used for construction of the palm and bottom of the fingers. Dual layer leather panels are used in the upper hand for the finest non-binding fit possible. Perforated leather on back of hand, inside each finger and top of fingers. Durable plastic armor with shock absorbing memory foam on the knuckles for extra protection. High impact use areas are all double stitched. Touch screen material on top of fingers. Neoprene panels in wrist with a Hook & loop wrist strap for a snug fit. Split rubber pads on top of fingers. Accordion padding at knuckle for protection and excellent articulation. Just as an FYI, you may have previous experience with European designed brands such as Alpinestars and REV’IT! which run about one half size smaller, size-for-size, than the American brands. It is not a universally true fact, but generally holds for most styles. So if a particular size in either of those brands is roomy on you, then you may be able to go down one full size in this style. Go here to see the Motonation Apparel size charts. These Campeon leather gloves are a great, value priced, short cuff leather sport glove. It has good armor over the knuckles and a nice feel on the hand. About Motonation gear: Motonation is a US distributor of many brands of motorcycle apparel and accessories in the US. One of their top brands is Sidi boots. They WERE the distributor for AGV Sport gear for many years before AGV Sport exited the US market in 2017. For 2018 Motonation developed their own line of gear to fill that niche. This is an all-leather glove and over half the back side of the glove is perforated leather. These will be good for mild to warm weather… maybe even hot weather if you keep up your speed! The knuckle amor feels sturdy and the leather has a reasonable thickness and quality. The palm area has two layers of leather and there is some integrated padding in the heel of the hand (the most often impacted area besides the knuckles). 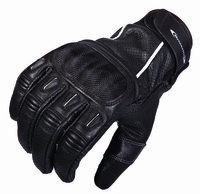 Motonation says: This short length leather sport & freestyle glove that delivers great dexterity and extra protection. Made of full grain cowhide leather throughout, and an extra layer in the palm. It also features dual panels in the upper hand for quick moves and great feedback.